Pledge’s Plan Ribbed Back chair offers contemporary design with practicality. The ribbed upholstery has been added for extra comfort using combustion modified high resilience foam which only adds to the comfort provided by the double curvature seat pad. Furthermore, the ability to adjust the arms, height, and back add to the comfort provided by this chair. Sporting a synchro mechanism for the ultimate reclining experience, the chair is customisable with many different colours of seat to choose from in two different fabrics, as well as many styles of base and seat type. Most suited to carpeted floors, the Pledge Plan Ribbed Back Chair sports a high back, sporting a classic feel overall. This makes it suited to all office environments, whether it be a communal office to a home study: this office chair really is an all-rounder! 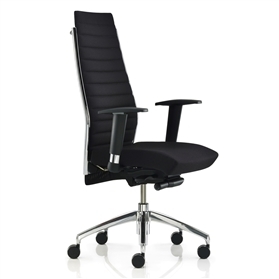 Guaranteed for 5 years with free delivery, be sure to get you Pledge Plan Ribbed Back Chair from Office Chairs UK for the best customer service and cheapest prices.